Recent years have witnessed a proliferation of disputes over how the past should be used, with alt-right demonstrations over the planned removal of Confederate monuments in Charlottesville/VA, the Hindu nationalist rewriting of Indian history, or the refashioning of the rural past in post-coup Thailand among those most widely reported. In all these instances, academic historians have either been sidelined, or have become the victims of politically motivated onslaughts. Still, the disputes per se are not a late modern phenomenon. Similar debates occur in any society that records its past. They form part of historical culture. But why is this so, and is there really nothing distinctive about the contemporary experience? Having a past and knowing it was considered to be a mark of civilisation. In the mid-twelfth century, the English chronicler Henry of Huntingdon remarked that what marked animals and brutes out was their absence of knowledge about their origins. Animals could not acquire it, and brutes would not. Similar sentiments were expressed in India, China, Persia, and the wider Islamic world. They formed part of the cultural repertoire with which literate societies sought to distinguish themselves from each other and from those over whom they exercised or they wished to exercise cultural and political hegemony. History recorded what was true. Similarly, in China, Sima Qian (145/35–86 bce) illustrated just how concerned he was with recording truthful history when he claimed that he had incurred the displeasure of Emperor Wu on refusing to malign one of the ruler’s generals — and that he was castrated as a result. Writing history was about uncovering the truth, even at considerable personal cost to the author. 1,500 years later, Ibn Khaldun (1332-1406) prefaced his monumental world history, the Kitab al-I’bar, with the Muqaddima, a book-length introduction. It illustrated just how frequently errors had been committed by Ibn Khaldun’s predecessors, listed reasons why such mistakes had occurred in the first place, and suggested means by which they could be avoided. Good history must, after all, be truthful. The inherent truthfulness of history could confer upon the past an almost sacral character. This was literally so when a sacred text delineated the origin as well as the early history of a people. But secular origin could equally acquire a quasi-religious aura. Independence days, forebears, and moments of past crisis crystallised essential historical truths that legitimised particular sets of values and institutions. The quasi-sacral character of history is essential for understanding disputes over its meaning. Precisely because history was meant to be true, a reading that violated one’s own understanding of the past could only be wilfully false. Disputes over the meaning of history, how it should be remembered, or which elements of it merited memorialisation, are thus never just about the past. Rather, they are concerned with the search for reliable and reputable precedent with which to reshape the present and forge the future. Saint Isidore of Seville by Bartolomé Esteban Murillo, 1655. Public domain via Wikimedia Commons. 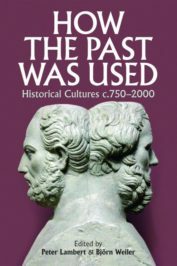 Superficially, this might explain why academic historians have been marginalised in disputes that are concerned more with the meaning of the past for the present, than with the factual accuracy of its representation. Yet, their self-image as truth tellers notwithstanding, academic historians have always participated in utilising the past to serve contemporary ends. Indeed, as recently as 2014 it was—albeit controversially suggested that history ought to be written with this ultimate aim in mind. Other factors must therefore be taken into account. In common English parlance, labelling someone a ‘historian’ can thus refer to a Professor of History, a TV presenter with only limited training in history, or a disgraced newspaper columnist with none. The phenomenon reflects a paradox at the heart of late modern historical culture: the very factors that helped bring about academic history also created the conditions for its marginalisation. The professionalisation of history was made possible by the economic expansion of Europe and America in the nineteenth century, and the desire to formalise and standardise training for forms of employment where specialist skills were deemed necessary. But rapid economic, social, political, and technological change also expanded the audience and the range of producers of history. Partly because of the centrality of the past to forging communal identities, and the sacral character history conveyed upon ideas, groups, and movements, professional historians never had a monopoly on interpreting the past. The resulting multiplicity of voices—even if not free of tension—could prove fertile and enriching. Yet it did so only while a fundamental premise was shared: historians might interpret their evidence differently, but they should never invent it. In many a recent dispute, we are, however, no longer dealing with different readings of the past, but with outright fabrication. Somewhat paradoxically, falsehoods can be told precisely because the inherent truthfulness of history is believed to provide legitimacy for modern beliefs. The resulting chasm between claims and evidence then requires that criticism be invalidated. Often, a discourse of faux egalitarianism is invoked: because of their expert status, those pointing out untruths are labelled a hostile elite denying the will of the people. It must be sidelined or, better still, silenced. And fact is either hollowed out at the root of its meaning (‘You have your facts and I have mine’) or disregarded and denied. The way is then clear to introduce ‘facts’ as claims which have no evidential base whatsoever. Featured image credit: The Plumb-pudding in danger — or — State Epicures taking un Petit Souper by James Gillray, c.1818. Public domain via the British Library. Björn Weiler is Professor of Medieval Political and Cultural History at Aberystwyth University. He is the co-editor of How the Past was Used: Historical cultures, c. 750-2000. Thank you, Dr. Weiler, for this thoughtful and important essay. I agree with you wholeheartedly, that academic historians should refuse to be silenced by contemporary opinion, often based on political underpinnings from both ends of the political spectrum. Applause to you and others who are willing to record and uphold history as it was lived, with all its brilliance and errors. Let not your voices be silenced! HIstorians are there to tell the history. Whenever a history is read, it is always in present. Dr Weiler has rightly raised those issues that try to sideline the historians especially the academic historians. However, the issue of interpretation, like the one which has been mentioned as Hindu reinterpretation, has to reviewed with same professional acumen and the demands of the craft of history, which attempts to provide “Quasi-sacred facts”. The way journalist version is declared history, the honourable writer has adopted that opinionated verdict about such issues. Anyhow, there are definitely some points which historian students can use to explain historicism and historiography. Thank you so much for pointing this out! This has now been corrected.